The future of higher education isn't always clear, but one thing is certain: Technology and social media will play an important role in the way colleges and universities communicate with students and share information online. Today, the savviest schools are using social media platforms to reach students at every stage of their academic journey, from applications to enrollment to graduation. Far beyond simply sharing campus photos or school events (though these practices feature prominently on most school's pages), modern colleges and universities have learned from other industries about the power of branding and digital marketing, using social media to attract students and keep them engaged throughout the course of their education and beyond. The schools on this list represent the cream of the social media crop in the world of higher education. Moving away from the stuffy reputation of academia, these schools are fluent in the modern vernacular of emojis, retweets, and hashtags, sharing content that's both engaging and informative. The smartest schools on the list have even figured out ways to harness their own students' usage of social media to create a stronger profile for their institutions at large, in turn drawing in more students. In terms of reputation and academic prestige, Harvard is hard to beat, and the school is practically synonymous with Ivory Tower elitism. Unsurprisingly, the university's social media following reflects this sterling reputation: Harvard has over five million Facebook followers, a number that more than doubles Yale's tally and exceeds the next four Ivy League schools combined. This tremendous popularity carries over to Twitter and Instagram as well. The school's social media accounts reflect the expansive interests of current students, alumni, and faculty, showcasing the achievements of Nobel laureate professors and the aspirations of recent graduates. On Instagram, users can view the school's picturesque campus and storied history, as well as check out cameos from celebrities like Elton John and prestigious alumni like Barack Obama. Harvard's Facebook page offers insight into student life, while also sharing unique campus events, many of which are open to the public. Stanford's proximity to Silicon Valley naturally funnels students into the world's technology capitol, so it's no surprise that the school boasts one of the top social media presences. With faculty and alumni that comprise some of the world's leaders in technology and research, Stanford's social media pages showcase an institution that is actively shaping most aspects of the modern world, from food to education to medicine. A quick perusal of the university's Twitter feed reveals a snapshot of 21st-century life, directing its 600,000 followers to material on artificial intelligence, substitutes for trans fats, and the use of video games to treat PTSD. Stanford's Facebook draws in even more users (1.2 million followers and counting) with similarly informative content along with inside glimpses of the school's impressive campus. Yale's reputation as one of the Ivy League's most prestigious universities translates to a major social media presence, with more than 1.3 million Facebook followers. Like many schools on this list, Yale is an incubator for future leaders and innovators, with a faculty and alumni network that boasts influential figures in the arts, politics, business, and just about every other field of note. Accordingly, much of Yale's social media presence highlights the work and achievements of its associates, from awards for alumni to New York Times articles penned by professors. The Yale campus also serves as a center of intellectual engagement and debate, and visitors to the university's social media outlets can share in the discourse, viewing videos of panel discussions, lectures, and other events. Some of the school's recent postings include a panel on "The Quest for Better Therapies" and the unveiling of a new video archive of Holocaust testimonies. The other elite university in Cambridge is no slouch when it comes to social media, boasting nearly a million followers on Twitter and over a million on Facebook. MIT's reputation rests on its cutting-edge research, and the school's social media pages reflect this commitment to innovation. Users can explore the institution's past, present, and future, viewing current research projects as well as past lectures from notable figures like Steve Jobs. A casual scroll through MIT's Facebook feed yields photos of robotics and electro-microscopy, along with news updates detailing latest developments in science, technology, medicine, and engineering. With just over 62,000 followers, the university's Instagram isn't quite as prominent. But the account still features plenty of photos documenting MIT's active campus culture and innovative scientific research. The school's message is clear -- MIT is devoted to serious research and serious learning. Another of the country's top public universities, U-M is home to more than 44,000 students, so it's no surprise that the school maintains a strong social media presence. With more than 750,000 followers, the U-M Facebook page emphasizes experiences of ordinary students and highlights recent graduates. The university also frequently digs into its ample history, producing unique photos and videos that span the 20th century. As a major research university, U-M has plenty to boast about, with video lectures and interviews that share professors' work on subjects as diverse as personal finance, public health, and modern cryptocurrencies. Much of its Instagram feed documents the achievements of the school's Wolverines teams, along with serious displays of school spirit. U-M is also one of the more prominent university presences on Snapchat, engaging thousands of students to share their own content. With an enrollment of more than 59,000 campus students, OSU is the third-largest university in the country and the largest in the Midwest. A school this large needs an outsized social media presence, and OSU delivers, boasting over 700,000 followers on its Facebook alone. A major center of research and education, the university produces notable work in most academic fields. A quick glance through OSU's social media postings reveals the scope of this activity, from sculpture and sleep science to the relationship between gender, grades, and job prospects. Much of OSU's content places academic research in practical, relatable context, such as an explanation of interest rates from a professional economist. Aside from academics, OSU is well known for its successful Buckeyes sports teams, and many postings, particularly on the school's Instagram, celebrate athletic accomplishments with the popular hashtag #BuckeyeLove. TAMU distinguishes itself with a relaxed, informal social media style that's as comfortable with emojis and SpongeBob SquarePants GIFs as it is with faculty research into subterranean radar technology. The school's Facebook and Twitter pages are peppered with same mixture of student activities, faculty achievements, and athletic celebrations that characterize all the top college social media accounts, but TAMU makes these announcements seem fun, with a comfortable, conversational verve that sits somewhere between Millennial and Gen Z. The school succeeds on Twitter in particular, where TAMU boasts the honor of maintaining one of the country's only school mascot accounts. Reveille the collie, "the First Lady of TAMU," boasts over 30,000 followers herself, with a Twitter page that showcases plenty of charming photos ops, including Reveille "studying for finals" and visiting TAMU alumni around the country. Gainesville is home to UF, a major public university that serves more than 55,000 students through 87 academic schools and departments. While a defined social media presence is now obligatory for all major higher education institutions, not all are created equal, and UF wins high marks for its humorous, clever Facebook page. Positioning itself somewhere between a traditional university and a YouTube variety channel, UF presents an assortment of unusual videos shot around the university campus. Ranging from informative to entertaining, the school's video presence touches on everything from Frank Lloyd Wright's UF fraternity house to hilarious videos of university president W. Kent Fuchs offering free rides in a golf cart. The school also keeps students guessing with April Fool's pranks: In one video detailing a (fictional) merger between UF and FSU, Fuchs and FSU president John E. Thrasher argue about how best to combine to school's two acronyms. With a student body of over 30,000, LSU is the most comprehensive university in Louisiana and one of the top higher education institutions in the South. Unsurprisingly, the school's size translates to a major social media presence, with more than a million combined followers across Facebook and Twitter. LSU's social media accounts reflect the institution's rich traditions of academics, culture, and athletics. A glance through the school's Facebook reveals an assortment of research accomplishments, student and alumni profiles, and informative historical achievements, such as the first human laser eye surgery, performed at LSU in 1988. Frequent video posts offer insight into campus culture, such as Spring Greening Day, Homecoming Week, and Mike VII, the school's tiger mascot. The Tigers, LSU's athletic moniker for 21 varsity sports, play a vital role in campus life, and social media allows current students and alumni to keep up with the school's sports culture. Another illustrious member of the Ivy League, New Jersey-based Princeton boasts more than 560,000 followers on Facebook and more than 300,000 on Twitter -- numbers that place it firmly in the upper echelon of higher education social media. The school was also an early adopter of Snapchat, introducing unique contests challenging students to create unique snaps of campus. This interactive innovation helped boost student engagement while simultaneously generating a wealth of new digital content for Princeton's own social media pages, demonstrating the type of creative thinking that's made the university one of the top stars of social media. Visitors to Princeton's other social media platforms can explore 3D images of campus functions (another innovation that many schools have yet to catch up to) along with informative postings that touch on everything from new hires to faculty awards and campus events. One of the largest universities in the country, UT serves a student body the size of a small city, with an enrollment of more than 51,000 undergraduates and postgraduates at its Austin campus. Despite its size, UT's social media presence demonstrates a distinct focus on individual student engagement: the school's Facebook frequently features posts encouraging students to share documentation of their university experience, such as photos that show how graduates have changed from freshman to senior year. Outside of interactive content, UT makes the most of its reputation as one of the top public schools in the country, sharing posts that highlight the lofty achievements of students, alumni, and faculty, such as the Cockrell School of Engineering's development of a hydrogen-fueled delivery vehicle. Social media is also an ideal forum for the university to show of its picturesque campus, including the iconic UT Tower and the renowned Darrell K Royal-Texas Memorial Stadium. A global university in a global city, NYU was an early adopter of most social media platforms, finding new ways to engage prospective, current, and former students. The university has been particularly active on Snapchat, using the app to connect with new students and share student-created content with prospective applicants. As a major center of education in one of the world's largest cities, NYU hosts an array of guest speakers, cultural events, and other activities, all of which are amply documented on the school's Facebook page. Boasting more than 750,000 followers, the NYU Facebook presents everything from guest speakers (most recently Canadian Prime Minister Justin Trudeau) to eclectic performances from the esteemed Tisch School of the Arts. NYU's Instagram account, home to more than 137,000 followers, also hosts an assortment of photos documenting both campus events and the school's stunning urban campus. Known as one of the "Public Ivies" for its affordable, quality education, Penn State boasts a strong social media presence, with over 400,000 Facebook followers and 115,000 Instagram followers. As a major research university, Penn State is home to an array of exciting developments in science and medicine; a scroll through the school's Facebook feed showcases research projects in subjects as diverse as bioengineering, geospatial medicine, and the immune systems of wasps. The university's social media presence also emphasizes student engagement, with frequent calls for user-submitted content and discussion. One popular project encourages students to submit side-by-side photos of themselves from freshman and senior year, reflecting on the changes they've experienced throughout their education. Another posting calls for recent grads to offer their best advice for first-year students. Penn State's Instagram shows off the campus' beauty, along with an inspiring number of marriage proposal photos. One of the largest, oldest, and most prestigious universities on the West Coast, UCLA serves as a center of research, education, and culture for the Los Angeles area, and the school's social media presence reflects this variety of functions. UCLA's highly active Facebook page celebrates the school's 100-year history while simultaneously looking to the future, with posts that highlight both past achievements and current works in progress. Recent featured stories include a piece on author Ray Bradbury, who completed most of his landmark novel "Fahrenheit 451" in the basement of UCLA's Powell Library, and an interview with Facebook VP of Operations Ellen Silver on the challenges of global community building in the digital age. UCLA's Instagram, which boasts over 167,000 followers, explores a different side of the school, with photos that showcase the beauty of the campus' historic architecture and the surrounding California landscape. One of the top research universities in the world, Berkeley's reputation for academic rigor and innovation informs its social media presence, presenting content that's both cerebral and creative. Berkeley's Facebook page showcases the school's many dimensions, from the academic to the historic to the practical. The school's nearly 500,000 followers receive updates on everything from campus news and announcements to student and faculty research and unique online resources. The hashtag #BerkeleyResearch points to the many innovative projects currently underway at the school: recent examples include a New York Times piece that highlights Berkeley students' research on the potential misuse of smart devices and a report on the evaluation of the human diet. The university also provides an assortment of unique online resources available to the public, such as the Heart Museum's digital portal, which documents one of the largest collections of anthropological objects in the country. Based in Tuscaloosa, UA might be best known for its Crimson Tide football team, one of the winningest in the history of the NCAA. The school's Bryant-Denny Stadium -- named for former president George H. Denny and legendary Crimson Tide coach Paul "Bear" Bryant -- figures prominently into much of UA's social media presence, with photos, videos, and other postings that represent a rich tradition of football. UA's athletic excellence isn't just restricted to football: The school also boasts strong teams in golf, softball, and a variety of other sports. Students, alumni, and fans can follow the activities of all these teams on the school's Facebook page, which boasts more than 560,000 followers. While sports are an important part of UA's campus culture, the school also ranks as one of the top higher education institutions in the south, and its social media presence also reflects significant student achievements such as Fulbright scholarships. With more than 33,000 students, BU is one of the largest universities in New England, and the school boasts a sizable social media profile that offers unique insight into campus life. BU's Facebook is notable for its collection of professional videos documenting campus events and activities, which is divided into categories such as campus life, students, research, alumni, and BU Commencement. These videos reflect the diversity of the BU student experience, showcasing everything from live music performances and art installations to the "My Own Boston" series, which documents how individual students engage with the city's unique culture. Research videos delve into the heady topics that occupy both professors and students, such as dark matter, medical exosuits, and flexible electronic circuits. BU's social media content also caters to prospective and newly admitted students, offering behind-the-scenes looks at campus facilities such as the library and the dining hall. A prestigious Ivy League university based in Ithaca, New York, Cornell boasts past and present affiliations with 57 Nobel Laureates, so it's natural that school's social media presence acknowledges that rich intellectual history while also looking to the future. A recent Facebook post, for example, details the school's successful 3D printing replication of the antique Cornell telegraph that received the world's first telegraphic message back in 1844. As a center of research, the school boasts unique accomplishments that fill its social media feeds, such as a recent online game designed by the College of Engineering to combat Alzheimer's. Unlike many colleges and universities, Cornell takes a participatory role in social media, responding to student questions and discussions within Facebook posts. Cornell's Facebook also serves a highly practical purpose as one platform for the school's CornellALERT system, which informs students and faculty of campus closures. One of the largest universities in the Pacific Northwest, UO occupies a 295-acre campus in Eugene, along Oregon's Willamette River. This picturesque setting makes for stunning imagery, and the school's Instagram feed uses the Pacific Northwest's natural beauty to great effect, showcasing gorgeous pictures of the campus and surrounding landscapes. Instagram followers also get a look at the fervor surrounding UO's Ducks athletic teams, of which the men's football team is particularly popular. High-quality photos highlight Ducks fans both past and present, along with action shots taken at the school's Autzen Stadium. The university's Facebook offers up further documentation of campus life, along with the unique accomplishments of UO faculty and researchers. Recent posts highlight professors' innovative research into topics such as the human genome, laser geology, and the use of virtual reality to treat Parkinson's patients. Event listings showcase diverse happenings like Asian Pacific American Heritage Month and the annual Mother's Day Powwow. Located in Morgantown, WVU is the largest university in West Virginia, enrolling more than 28,000 students through its main campus alone. 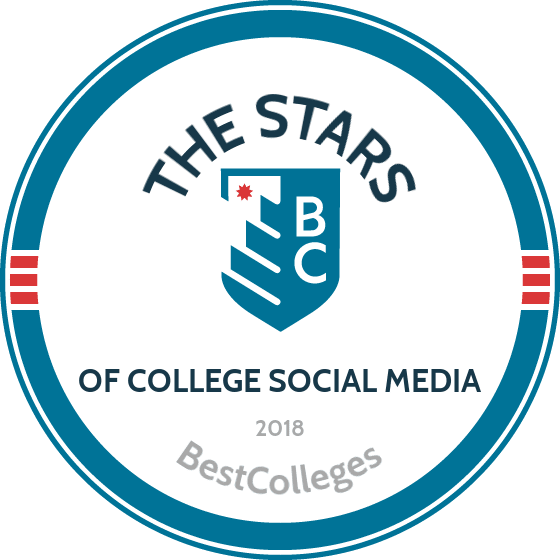 While it may not have as many followers as some of the schools on this list, WVU distinguishes itself with an innovative, student-centered approach to social media, offering a level of interactivity that's uncommon among most colleges and universities. The school's Facebook page reveals the depth of this student engagement, such as live chat sessions with university president E. Gordon Gee and a panel of academic experts that allow incoming freshman to ask questions about WVU. Unlike most colleges and universities, WVU takes an active role in Facebook discussions, often responding to user comments with humorous GIFs, emojis, and other examples of social media savvy. The school is also a major proponent of Snapchat, using the app to promote campus events and encouraging students to submit their own snaps. Frequently ranked among the best universities in the world, Duke is renowned for its academics and athletics, both of which feature prominently on the school's social media accounts. Duke's 350,000 Facebook followers are privy to an assortment of posts highlighting the school's unique research, several of which emphasize user participation. For example, a recent posting offers users the chance to ask live questions during a lecture on current technology and the future of the brain. Duke's primary Twitter account offers up the same mixture of research, academic accolades, and interesting publications from faculty members, but the university also maintains an array of secondary accounts that share information on topics such as admissions and athletics. Duke's Instagram, which boasts over 80,000 followers, offers a photographic perspective on the school's ample accomplishments, with images that showcase research developments, athletics, and campus architecture. From 3D-printed prosthetic limbs to baby lemurs to Blue Devils basketball, the university's Instagram presents a colorful take on campus life. The oldest and largest university in Wisconsin, UW-Madison is also among the largest schools in the Midwest, with a student body of over 43,000. The university's nearly 400,000 Facebook followers receive news on campus events, faculty and student accomplishments, and glimpses into the schools 150-year history. Frequent posts on the UW-Madison Facebook page explore everything from experimental transportation systems to the history of the universe, along with more earthly topics like graduation festivities and tips for returning students. UW-Madison also peppers its social media accounts with a variety of interactive activities, such as the hashtag #BuckyonParade, a project that encourages students to seek out and document statues of campus mascot Bucky placed around Madison. In another example of the school's unique social media usage, Twitter followers can pose questions to the university's "Weather Guys" about how best to prepare for severe weather. Serving more than 50,000 students from its campus in Tempe, ASU is one of the country's largest universities, but it's also know for its innovative approach to education, which carries over to its social media presence. The school hosts a wide variety of content designed to appeal to both current and prospective students. Much of ASU's Facebook, for example, focuses on student experiences, with videos documenting study abroad programs, sporting events, and campus activities. The school even features content specifically aimed at parents, including informative articles on how families can stay connected to their students via technology. Like all the best social media strategists, ASU engages students with participatory content, like a posting that calls for recent graduates to submit images of their mortarboards. The school's Twitter also showcases the highly active campus community, with posts detailing the ASU's Sun Devils athletic teams' victories and faculty contributions to major national publications like the Washington Post. Based in Lexington, UK is the largest university in Kentucky, with a total of more than 30,000 students enrolled annually. The school's Facebook page is a must-follow for students, staff, and faculty, as it offers important updates on campus initiatives, resources, and research awards. Aside from the practical, UK offers plenty of eclectic, engaging content, such as 3D videos of the campus, profiles of graduates, and alumni appearances on the TV show "Jeopardy!" The school's Twitter feed hones in on the school's various accomplishments, including faculty research, sports victories, and unique campus features like the UK Horticultural Research Farm. On Instagram, the university emphasizes the natural beauty of the campus along with its extensive athletics program. Users get access to high-quality photos that capture the excitement of UK's championship men's basketball team, along with a unique selection of historical images dating back through the early 20th century. Based in Waco, Texas, Baylor is a Baptist university that ranks high for its level of student engagement on social media. The Baylor Facebook page trumpets the school's varied accomplishments, such as national wins at competitions in music and publishing deals for graduates. Video content offers a glimpse into campus activities like "Baylor Ninja Warrior" along with miniature profiles of graduating students and community leaders in the "Baylor Lights" series. Sports also play a prominent role, and the Facebook page displays events for most of the school's games, including softball, football, and soccer. Event listings also include an assortment of educational and community events that are open to the public, such as the Top Shot Sporting Clays Competition, networking seminars, and guest lectures. Baylor's Twitter feed offers a casual, conversational tone that includes both typical announcements and quirky postings about the Waco area, such as a photo series of forgotten town landmarks. We ranked these schools based on several quantitative and qualitative factors, which obviously include followers across the three major social media platforms: Facebook, Instagram, and Twitter (not to mention some savvy Snapchatters). However, there are other, less tangible factors that play into a school's social media presence. Namely, how interesting is it? How well does it engage students? And what is it doing that other schools aren't? While the answers to these questions can't be tabulated, it's easy to tell a great social media presence from a merely good one, and this list also gives nods to some lesser-known schools that have made clever, innovative moves across different social media platforms.